The first thing people usually notice about one another is the eyes. We use common expressions such as "seeing eye to eye" and "eyes are the windows to our souls". By looking at someone’s eyes, we can usually tell if they’re happy, sad, or even frightened. But it’s not just the eyes themselves that are expressive. It’s also our eyelids and brows that help project the emotions we’re feeling. For many people, the most frustrating sign of aging is the change they see around their eyes. Even if we exercise regularly and stay physically fit, the skin around our eyelids can sag from dermatochalasis, and the eyelids themselves can droop as a result of ptosis. Then when we look in the mirror, we don’t see the fit body; we see old eyes looking back. Although vision may not be affected by cosmetic eye conditions, some may not like what they see in the mirror. If you are one of these people, you no longer have to accept these visible signs of aging. Today, there are surgical and non-surgical options for cosmetic eye procedures. Although purely cosmetic procedures are usually not covered by insurance, today’s oculoplastic surgeons offer cost-effective treatments to improve your appearance. 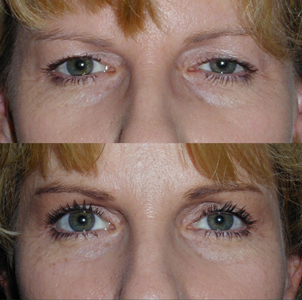 Blepharoplasty is the most common surgical treatment for aging eyelids. Both dermatochalasis and ptosis are treated in a minor outpatient procedure called blepharoplasty, the medical term for eyelid surgery. Our board certified oculoplastic surgeon performs this surgical treatment to achieve the best acceptable cosmetic and functional result. During the procedure, your ocular plastic surgeon will remove excess skin and fat from your eyelids. In addition, he will tighten the connecting tendons and muscles to improve the function of the eyelid. This process will improve both the cosmetic appearance and function of the eyelids. Your eye may appear to be slightly bruised and swollen following the surgery. However, this should not cause significant discomfort. Your surgeon will follow-up with you to monitor healing and check for signs of inflammation and infection. Some potential complications from surgery include the risk of bleeding, infection, and hematoma, which can usually be successfully treated. In addition, a small number of patients may have temporary or permanent difficulty in fully closing their lids when they sleep. In such cases, special ointments or drops may be used to maintain lubrication in the eye. Most patients who are dissatisfied with the way dermatochalasis and / or ptosis affect their appearance believe the cosmetic and functional benefits from blepharoplasty outweigh these risks.